← Update on the dogs. So this year I have decided to take part in Project 52. At least one new blog post a week. With that in mind here we go. I have a few things that I want to accomplish this year. Finish scanning in all the family photos. Fix up our front and back yards including putting up a fence for the girls. The last one is the most important. Right now I’m still having some issues with the Crohn’s Disease which has made my life pretty miserable. I’m on Humira right now and it seems to be working but there are a few side effects. The major one is that I have no immune system. If someone sneezes near me I get a cold, this has led me to being sick all the time. I’m really hoping this is the year that everything changes. The other goals are pretty self-explanatory. I have been really slackass on scanning photos and I plan on spending at least one hour a day getting them all scanned and putting them on fullerfarm.net. I have pretty much finished the Fuller family genealogy as there is no way to get past Ezekiel Fuller (1650-1723) as all records are gone. I am working on the Chamblin side next. I want to learn a new language to improve my skill-set. 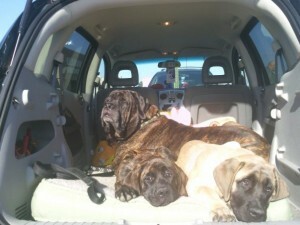 Now the main focus of my blog will be me dealing with Crohn’s and dealing with our dogs Percy, Luna, and Soleil. Life with three English Mastiffs is always interesting. Percy is out 10 year old male who rules the house. Luna and Soleil are our 6 month old girls. I’m not sure if my house, car, bank account, furniture, bones will survive. So stick around and check back at least once a week and join me as I try to document a year in my life. This entry was posted in Crohn's Disease, Family, Percy, The Girls. Bookmark the permalink. One Response to Start of a new year and a recap.